My fifty-eighth stadium of 2011 was on Thursday 1st September 2011 at Vicarage Road in Watford, Hertfordshire. The match was England Under 21s vs. Azerbaijan Under 21s in 2013 European Under 21 Championship Qualifying. Vicarage Road is around half a mile from Watford High Street railway station although the more frequently used Watford Junction railway station is also close, as it is just a mile away. The stadium is the home of Championship side Watford who have played there since it was built in 1922. On my visit the ground consisted of three all-seater stands with the final section awaiting final demolition before building of the new Sir Elton John Stand could commence. The old structure was a mixture of seating and terraces and had been closed from 2008 up until the opening of the new 3,100 stand in December 2014. This was expanded by a further 700 seats upon the club's promotion to the Premier League in 2015. On of opposite side of the pitch on the south-west side of the ground is the Rous Stand, the only two-tier stand in the ground. 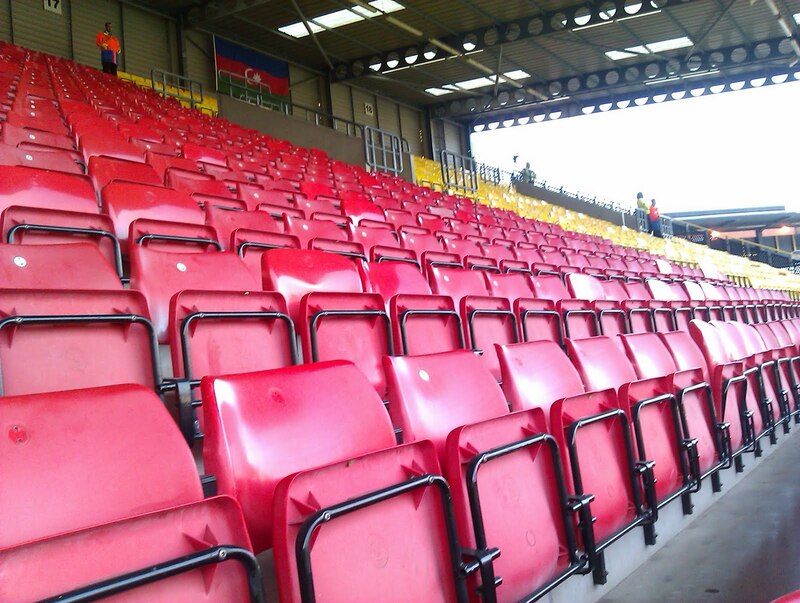 The two stands behind each goal were built in the mid 1990s - the Rookery Stand on the south-east side of the ground has a capacity of just under 7,000 and the Vicarage Road Stand on the north-west side of the ground has a capacity of 5,800. Ordinarily this houses away fans on the right side of the stand although this was not really an issue for this game. I took my place on the left side of the stand to watch the game. The game saw a very comfortable victory for England over a weak Azerbaijan side. The home nation opened the scoring on just 4 minutes when Craig Dawson nodded in a corner and doubled the lead after 21 minutes with a smart overhead kick from Henri Lansbury. Just before the break a superb curling shot by Jordan Henderson made it 3-0 and though England were restricted until the 73rd minute to notch up their fourth goal it duly came thanks to Henri Lansbury bundling the ball over the line. The goal of the match came on 79 minutes when Martyn Waghorn scored a spectacular 30-yard drive and the rout was finished on 89 minutes with Craig Dawson heading in his second of the match to wrap up the 6-0 victory. Nice review, how long has it been since the old Main Stand was torn down? I was hoping to visit while it was still standing but it looks like I've missed the boat! Not sure exactly when it was torn down but I think it's been closed since 2004. They got planning permission to build a new stand over three years ago but haven't started any building work yet.